On Friday, May 15th 2009, Scott Schechter died of a sudden heart attack. It's a bit ironic and fitting that he was on his way home from working on yet another project. He has left a void in the world of Garland/Minnelli fans everywhere. I am shocked and saddened by his tragic death, and I send my deepest condolences to Scott's husband and family. Scott was the premiere Judy Garland/Liza Minnelli historian/author. His work encompassed all types of media: CDs, DVDs, books, publications, and the Internet. Scott was always - and I mean always - 100% supportive of The Judy Room and The Judy Garland Online Discography. He was a delight to talk to, and I'm glad to have met him and I'm very proud that he was more than a colleague, he was my friend. Scott was incredibly passionate about the lives and careers of both Judy Garland and her daughter Liza Minnelli. He was committed to getting previously unreleased material (or material that hadn't been seen in decades) into the hands of the public. He was also committed to celebrating, as he called it, "The Legend's Legacy" (Judy Garland). Scott was close to Liza. 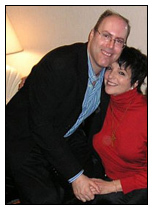 This relationship helped forge one of his greatest projects, Liza's official U.S. website: OfficialLizaMinnelli.com [now defunct]. I am proud that he came to me to design the site and to perform the periodic updates and maintenance. I would tell people that I was "once removed from Liza", meaning that Scott would talk to Liza and/or her managers & publicists, and then relay the information to me to add to the site. Scott was very proud that the site became the main Liza site of the web. And I am thrilled to have helped him see his ideas come to life on a living website. The following is his biography from his 2004 book "The Liza Minnelli Scrapbook" - followed an update from me. When looking at his work, it's amazing how varied Scott's projects were. All of the images here are projects that Scott either produced or worked on in some capacity. Without Scott, we probably would not have had the amazing Pioneer DVDs of Judy's TV series, nor would we have the remastered and complete CD releases of Judy's Capitol albums "The Letter" and "Garland at the Grove", among so many other treasures. Scott Schechter has devoted over a quarter of a century to researching the lives and careers of Judy Garland and Liza Minnelli, earning his status as the premier Garland-Minnelli authority. His research and devotion have led to his working with many of the companies that continue to release Garland-Minnelli material, including Capitol Records and Pioneer Entertainment / Classic World Productions, Inc. His expertise as a Garland-Minnelli historian has been acknowledged on his TV and Radio appearances; as a source in PR functions; and in dealing with media such as Liz Smith, et Al. Mr. Schechter is perhaps proudest of his role as archivist, which has led to the uncovering and releasing of rare or lost material. TV shows that Mr. Schechter has consulted on as a Judy Garland or Liza Minnelli authority have included ABC’s “20/20,” “Good Morning, America,” AMC’s “Behind The Screen,” NBC's "Dateline," and A&E's "Biography" series. E! Entertainment Television’s recent “True Hollywood Story” 2-Hour special on Garland’s life and career was critically acclaimed by TV Guide and USA Today, etc. ; For this episode -- which was one of the 15 highest-rated "THS" shows of that series' 5-year and 200-episode run -- Schechter served as Consulting Producer. The program was honored with a GRACIE AWARD, and was nominated for a PRISM AWARD, for best TV documentary. For his marketing and PR efforts, Mr. Schechter has obtained the highest profile exposure for his clients. Media such as Rolling Stone magazine, USA Today, Fox News Channel, ABC Network, E! Entertainment, and TV Guide have been utilized. Mr. Schechter’s liner notes on other Garland-Minnelli projects have been mentioned in USA Today, Billboard, and the Los Angeles Times. As a writer, his words on Garland and family have appeared in the Advocate, Show Music magazine, and three editorials printed in the New York Times (1994, 1998 and 2001). In 2000, Mr. Schechter was instrumental in getting Garland’s historic, Grammy-winning Album Of The Year “Judy at Carnegie Hall” released complete and uncut, exactly as it happened that night, in its proper running order -- for the first time ever -- and as a deluxe 24-Karat Gold audiophile set. Schechter’s other CD projects include Capitol Records’ “Judy at Carnegie Hall : Fortieth Anniversary Edition” and that label’s new 2-CD set of material he produced and compiled, called “Classic Judy Garland -- The Capitol Years (1955-1965)”; Collectables Records’ “twofer” CDs (under license from Capitol) : “Miss Show Business / Judy” and “Judy: That’s Entertainment! / I Could Go On Singing”; S&P Records’ “twofer” CD (under license from Capitol) : “Judy in Love / Alone”; Varese Saraband’s “Engelebert Humperdink's: You Belong to My Heart"; Hip-o Records / Universal Music's "Liza Minnelli: Ultimate Collection" - which Miss Minnelli liked so much she mentions the CD in her latest concert souvenir program - and that label's definitive audio compilation he produced and compiled of Garland's TV series; "The Judy Garland Show: The Show That Got Away" included legendary duets, plus solos and rare outtakes. In 1998, Schechter was one of the people instrumental in bringing Garland's entire long-lost 1963-1964 TV series to the DVD format. 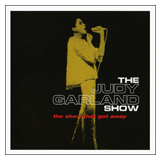 The discs of "The Judy Garland Show" from Pioneer and Classic World Entertainment have been a monumental success. Schechter served as a consultant to the five-year project, including handling media, crafting "The Show That Got Away" slogan, and compiling the "Just Judy" and "Songs for America" discs. The latter's proceeds were donated to the American Red Cross in the way of 9/11. Schechter conceived this tribute disc. In June 2002, [Scott's] book on Garland was published to coincide with the icon's eightieth birthday. "Judy Garland: The Day-by-Day Chronicle of a Legend" presents the entirety of her life, with an emphasis on her career and legacy. Liz Smith called the book "an impressive mass of talents. It is beautifully produced and sure to thrill Judy's evergreen fans." The "Los Angeles Times" stated "Scott Schechter's book not only chronicles her difficult life, but also proves how hard she worked to overcome obstacles . . . Exhaustively researched." "Publishers Weekly" noted "it is sure to have enormous appeal as a reference tome and have multiple uses for trivia buffs," and Robert Osborne of the "Hollywood Reporter" devoted his entire column to the book, raving, "Almost overwhelming in its detail, Schechter's research is as thorough as a Nobel scientist . . . It's the most complete retrospective yet published on a celebrity." 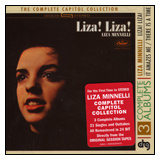 Since that bio, Scott produced "Liza Minnelli:The Complete A&M Recordings" for the Collector's Choice label. He also wrote the liner notes for the booklet. Scott also produced the releases of Judy's two never-before-released-on-CD Capitol albums "The Letter" and "Garland at the Grove." 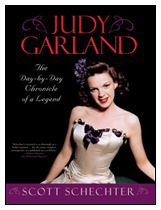 Scott's publication "Garlands For Judy" was a fitting tribute to Judy, or as he referred to it "The Legend's Legacy". Each issue just got better and better. I don't know the number of subscribers, but I know it must have been quite a lot. The magazine was published 4 times a year. It will be sorely missed. At the time of his death, Scott was working on the soon-to-be-released CD set "Judy Garland and Liza Minnelli - Live at the London Palladium". The concert - new to CD - will be complete and remastered, with liner notes by Scott. We think. We're told that he was finalizing the notes the week he died. Scott was also working on getting "Liza at the Winter Garden" released to CD for the first time. No word yet on the status of that project. As you can see, Scott was involved in so many things. In addition to the above, he helped Liza with her recent smash live concerts at The Palace Theatre in New York. On a personal note, I'll always be grateful to Scott for not only supporting The Judy Room, but involving me in tiny aspects of some of his projects. He was always 100% kind and generous to me. We met when he was in town promoting his Garland book. After his presentation, I came up to his table to have him sign my copy, and when I said who I was he immediately hugged me and exclaimed "Judy Room Scott? Why didn't you tell me you would be here, we could have had dinner earlier!" He made me feel like we had been friends forever. Scott had a great sense of humor, and laughed off the "flamers" out there who were always so negative about things pertaining to Judy and Liza. He never trolled the Garland/Minnelli chat rooms/groups/discussion lists trashing the work of any Garland/Minnelli project he might not be a part of. Nor did he troll the same sites and act as the "be all, end all" expert or to seek validation by constantly correcting people from some imaginary Garland/Minnelli Mount Olympus. He was beyond that. Besides, I think he was just too busy posting the dozens of daily Liza updates to his Liza Yahoo Group and of course all of his various projects to worry about such trival things! I'll never forget his excitement when he called me and relayed his experience of being with Liza in the recording studio, just the two of them and the sound engineer, while Liza recorded the commentary track to the DVD release of her Emmy Award winning TV special "Liza with a Z!". Oh, how I wanted to be there!!! The next thing I knew, Scott had Liza personally sign a copy of the DVD and sent it to me. That's the kind of person he was. Scott was a friend, a colleague, and one of "the good people" out there who's excitement and passion for the lives and amazing accomplishments of Judy Garland and Liza Minnelli never wavered. To quote his usual email signature, I send to him and his family "all the best and warmest".